Aspic, a savory meat gelatin made from consomme, clarified stock, or bone broth, gets its jiggly texture when the consomme cools. That texture can be off-putting and aspic has had its ups and downs over the years. But aspic has managed to stick around for centuries and has never quite disappeared from people's diets. While its most recent American heyday came to an end in the early 1960s, aspic has kept its popularity in Russia and the countries of the former Eastern bloc, where it's regarded as a winter treat. Called kholodets, this aspic is often served with vodka. Closer to home, tomato aspic is no stranger to those living well south of the Mason-Dixon line. Ask any southerner and you'll likely get a rave about a relative's tomato aspic or a turned up nose. As for the aspic itself, it can be as simple as four ingredients at its most basic, or a more piquant and extensive version that includes hot sauce or Worchestire—think a gelatinized bloody mary without the alcohol. Making aspic at home is time-consuming, so some cooks speed the process along by adding gelatin to a basic clear stock. Choose your bones carefully. You want to pick bones with plenty of cartilage. Pigs' feet, and beef or pig knuckles work well, and so do chicken feet. The more tendons on your bones the better. Bring the bones to a boil and add thyme, parsley, onions, celery, and carrots. Boil gently for several hours. Remove the bones and strain the stock through cheesecloth. You may have to strain your broth several times because you want your aspic to be clear. Pour the cooled stock into ramekins or molds. If you want, you can cut up vegetables, cooked chicken, fish, or meats and put them in the containers before you pour your stock. Refrigerate your aspic overnight. Even if you don't set out to create an aspic, you still might find that you've made it incidentally. For instance, if you make a chicken soup and serve the cold chicken afterward, the gelatinized substance that clings to the chicken bones is essentially aspic, and that's what gives the cold chicken its flavor. 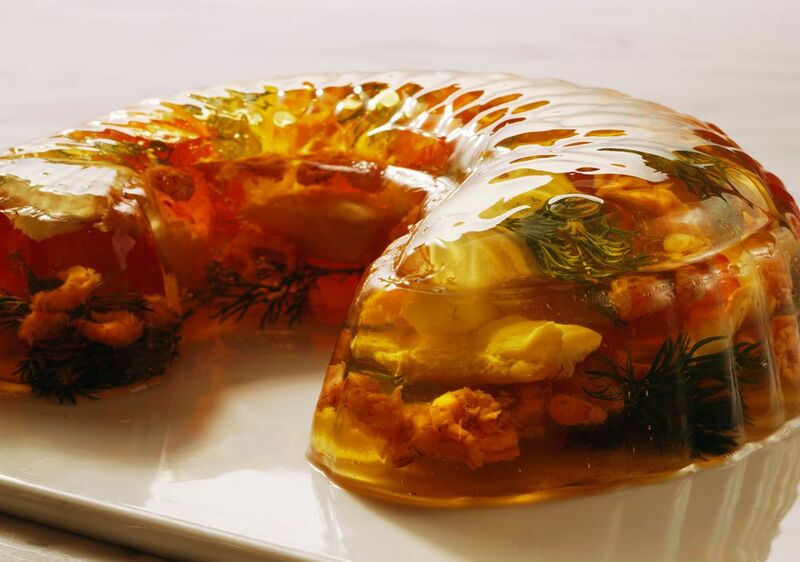 Back in its earliest days—aspic has been around since the late 1300s—this meat gelatin was prized because it was an effective way of preserving foods, sealing off the oxygen and preventing the growth of bacteria that caused food spoilage. It hasn't lost that property, but refrigerators and freezers have eliminated aspic's preservation role. Today, aspic is commonly used as a glaze for appetizers and for cold food platters.